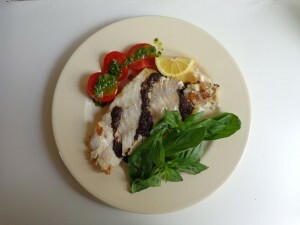 The rascasse is a firm-fleshed fish that holds together well during cooking, but it is not essential for this recipe. If you can’t find rascasse, simply substitute another firm-fleshed saltwater fish — cod, porgy, striped bass, etc. Preparation goes very quickly, so have your side dishes ready before you begin. Small tomatoes halved and drizzled with pistou — French pesto — make a nice garnish, as shown in the photo above. Begin by making the tapenade. If you don’t have time to make your own, choose a high-quality brand, preferably French. In a small dish, mix a tablespoon of tapenade with 1 tbsp. olive oil. The idea is to thin it enough to be able to drizzle it over the fish. Test to see whether it will run off the end of a spoon in a stream — if not, add a little more olive oil. Rinse the fish fillets and pat dry with paper towels. Remove any visible bones. Heat the remaining 1 tbsp. olive oil to sizzling in a large skillet. Add the fish. Sauté over medium-high heat for 2-3 minutes per side, depending on the thickness of the fillets. To check for doneness, insert a knife. If the flesh is opaque, the fish is done; if it’s translucent, cook for another minute or two. Transfer the fillets to individual plates. Drizzle with the tapenade sauce. Add a lemon wedge and some fresh basil leaves for garnish. Serves 2.